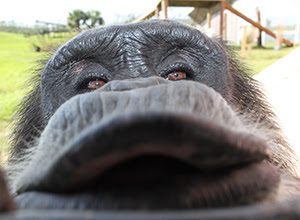 We announce with heavy hearts the loss of our dear friend Zeke, a beloved male chimpanzee who lived in Alice’s Family. Zeke was high ranking in his family and was known for his fairness, dependability, and playfulness with the chimpanzees in his group. Zeke was born November 19, 1992 at the Coulston Foundation research laboratory in Alamogordo, NM to his parents Crystal and Ali (aka Ally). He remained with his mother for five days before being taken from her and moved to the laboratory nursery, where he was raised for approximately a year and a half. When he was not quite two years old, he was assigned to a research study but fortunately for him it was cancelled after a week—and there is no record of Zeke ever being assigned to a research study again. In 2002, when Zeke was 10 years old, Save the Chimps rescued the 266 chimpanzees living at the Coulston Foundation, which was facing bankruptcy after repeated Animal Welfare Act violations. 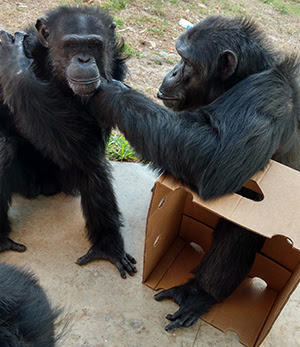 Upon finding many chimpanzees in the laboratory living in isolation, Save the Chimps staff immediately began social introductions to form large family groups. Young Zeke was integrated into the first family group we formed – Alice’s group. Garth, Mika, Pamela, and Zeke in New Mexico shortly after their family group was formed. Zeke was a man of many nicknames among his caregivers. He was extremely handsome and often described as “the Brad Pitt of chimps” around the sanctuary. Other words like “magnificent” and “stunning” were often used to describe him. In fact, our late founder, Dr. Carole Noon, always described Zeke as the most handsome male chimpanzee she had ever seen. Despite his powerful and dignified appearance, Zeke was secretly a goofball in disguise. Countless times, caregivers would catch Zeke being silly when he thought no one was looking. Whether it was initiating a game of tag with one of his chimp friends, finding a toy and playing all on his own, or doing headstands, Zeke just couldn’t resist giving in to his silly side – even though he clearly expected everyone to take him seriously! He was also always highly curious about what the humans were up to. Caregivers would often turn around and be surprised to see Zeke quietly keeping a close eye on them! Most of all, Zeke relished sanctuary life, especially the company of his friends and his expansive island home. He was a kind and fair second-in-command to the group’s alpha, Elway. Zeke could be depended on to help break up squabbles between some of the female chimps, and always avoided wrapping himself up in real conflict. He got along well with all the chimps in his family, but one of the most special bonds he had was with a chimpanzee named JR, who has an emotionally traumatic past and can sometimes struggle with behavioral outbursts of sudden distress. Instead of reacting with confusion or hesitation, Zeke always came to JR’s side to calm and reassure him. Zeke was an incredible friend to JR and always seemed to understand exactly what he needed when he was upset. Despite the fact that Zeke absolutely loved to be outside on his island, when he wanted to spend time with JR he would refuse to go outside, but rather stay indoors where JR preferred to be. We were able to see Zeke’s friendship support and guide JR through incredibly difficult emotions he struggled to navigate through on his own. In the weeks leading up to Zeke’s passing, he had become particularly close with a male in his group named Garth. The two would often be seen on the island together grooming or just spending time close to one another. Though Zeke had always gotten along well with everyone, caregivers were surprised to see how close they had become in a short period of time. Zeke collapsed and passed away suddenly due to heart failure with no prior symptoms, which, sadly, is not uncommon for males his age. We take a small amount of comfort in knowing that he passed quickly and likely with minimal pain, and that he had been in a wonderful, playful mood in the days before he passed away, with no signs of illness or discomfort. After his passing, Garth stayed with Zeke for a long time, seemingly not wanting to leave him. We let Garth stay with him as long as he wished and later performed our passing ritual to honor our beloved residents we lose. We are grateful to have known magnificent Zeke and to have given him a loving, spacious home with green grass and blue sky before he was ever subjected to invasive medical testing. We will deeply miss his goofy, loving heart that brought so much light to those around him. We will carry his memory with us as a reminder of the healing that true friendship can bring. Rest in peace, Zeke. We will miss you always.